Animate Brown with Cream Trim Padded Dog Coat 30"
Home > Animate Brown with Cream Trim Padded Dog Coat 30"
A brown outhwaite dog coat with cream trim round the edge of the coat. This coat is waterproof, windproof and breathable. 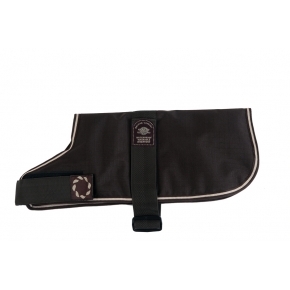 Adjustable velcro chest and waistbands ensures a comfortable fit for your dog. The waist band also has a sliding buckle for adjusting the girth strap to fit even very slender dogs. This coat is fully machine washable. Animate Outhwaite Blue Green Underbelly Dog Coat 30"